The US president is not, however, satisfied with the agreement presented by Republican and Democratic negotiators on the construction of his wall on the Mexican border. 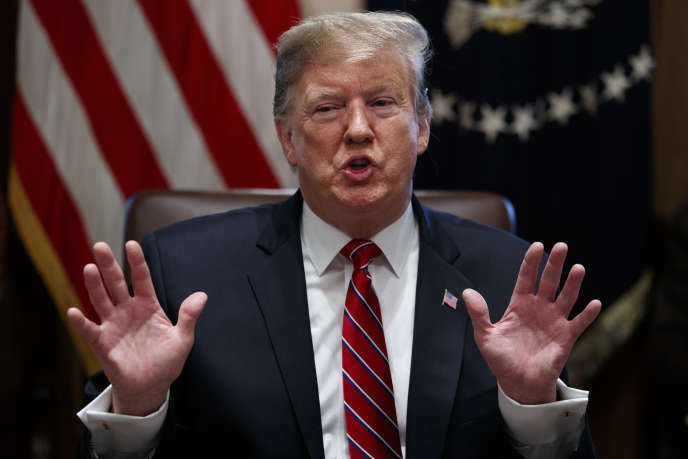 US President Donald Trump said on Tuesday (February 12th) that he was dissatisfied with the agreement presented by Republican and Democratic negotiators on the construction of his wall on the Mexican border. It has, however, removed the prospect of a new paralysis of federal administrations. Washington has until Friday midnight to avoid a new stalemate that would lead to the sudden drying up of budgets, or shutdown, by 25% of US federal administrations. On Monday night, Republican and Democratic negotiators reached a tentative budget agreement. It plans $ 1.3 billion to build about 90 km of new barriers on the border with Mexico to fight illegal immigration ... far from the demands of Donald Trump, who claims nearly 6 billion. "When we add what I have to add, it will work, we will build a beautiful wall, big and solid, that will not let criminals and drug traffickers and drugs into our country. I do not think we are going to have a shutdown. I would not want it and if there was one, it would be the fault of the Democrats. " Faced with a Congress divided between the two parties, any budget law must be the subject of a compromise. Donald Trump has a veto and could block it, but the pressure is immense on the president to avoid a new shutdown. The United States is still reeling from the longest partial budgetary impasse in its history, when eight hundred thousand civil servants were placed in forced unemployment or worked without pay for thirty-five days, until January 25th. Not to mention the many contractors who did not receive their pay retroactively. After this intense showdown with the Democrats, the billionaire had finally yielded by signing the temporary budget law that is valid until Friday, and that does not include funding for the wall. A further retreat would be very embarrassing in the face of its electoral base, which aims for reelection in 2020. Asked about Donald Trump's statements, Democratic Senator Patrick Leahy, who is participating in the negotiations, said that the agreement presented would not be retouched and that he expected a budget bill to be presented to him. the upper chamber from Wednesday night. "Most of the Democrats and Republicans I spoke to in the Senate and in the House are satisfied with the result," he told reporters. The Senate Republican leader, Mitch McConnell, earlier on Tuesday hailed this agreement as "good news" . His words are important, since Mr. McConnell had refused, for the duration of the long shutdown, to submit any law to a vote without the assurance that Donald Trump would sign it. He had been scalded by a sudden change of the Republican President on a first budget agreement. A compromise text had indeed been approved in the Senate in December, apparently with the guarantee that it satisfied Donald Trump ... until the outraged voices of ultra-conservatives pushed the president to turn around. However, these same ultra-conservative commentators and elected representatives do not like at all the agreement announced Monday night. A "rotten compromise," blasted Fox News presenter Sean Hannity, who has the ear of the president. The agreement "is not a serious attempt to secure our border or stop the flow of illegal immigration," said representative Mark Meadows, influential member of the Tea Party. It remains to be seen how Donald Trump will react this time under their criticism. In addition to additional funding originally still uncertain, the Republican reserves another possible way out. For several weeks, the threat of recourse to an exceptional emergency procedure, to unlock the necessary funds without going through the Congress, is brandished by the White House.